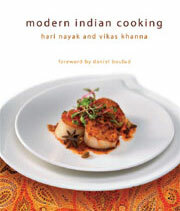 Hari Nayak is more than a chef, today he is a restaurateur, author as well as a culinary consultant in North America. Hari Nayak started his epicurean journey from the Culinary Institute of America and today, he is one of the most sought after chefs for his unique style. When it comes to Indian food, the common misconception is that the preparation style must be complex. Hari has managed to elucidate that Indian cooking can be prepared in a simplistic style, with all the modern trappings, yet appealing to the common household cook at the same time. After working in India then traveling to the culinary institute, he went on to work in restaurants in New York, London & Paris. 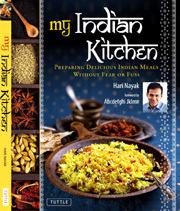 Today, he is the author of the 7 bestselling books like Modern Indian Cooking and My Indian Kitchen, these books feature the simple yet eclectic style of Hari’s dishes. Hari Nayak has managed to provide a new modern outlook on Indian cuisine, one that is creating a sensation of sorts in North America today. 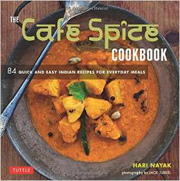 In his latest book The Spice Trail he has simplified many of his modern global recipes for a home cook, presenting ingredients, methods and flavours that he has discovered as a resident of New York City. Join him on his wanderings through food! . ‘Masti’ which translates to ‘fun and mischief’ infuses modern with tradition and colour with flavor, creating an expression of ‘New India’. Our array of Indian inspired sharing plates take cues and influence from a variety of global flavors. Read More. 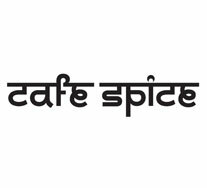 Cafe Spice is one of the largest Indian food service companies in America with a mission to promote Indian cuisine and make it accessible to everyone through grab n’ go meals, retail line of products and branded QSR. Tandur is a fast casual Indian dining concept was developed and in operation in Knoxville, Tennessee. The menu is regional Indian and the dishes on our menu are innovative, modern with local influences. Soul Curry serves innovative Indian cuisine in the heart of downtown Hoboken. Locally sourced seafood, meats and produce from a clutch of area farms make up our shareable plates, offering a globetrotter’s spin on comforting Indian classics. Bombay Bungalow is a home grown brand in Dubai featuring re-imagined and approachable Indian dishes. Our aim was to create a menu that is tasty and exciting to the multi-faceted residents of the UAE. 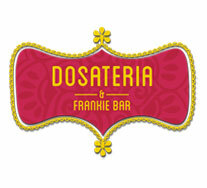 Dosateria is a quick service restaurant concept that moves away from the traditional south Indian crepe and presents itself in an all new create-your-own avatar using local ingredients bursting with global flavors. My Mosa – Dubai based quick service concept inspired from the timeless ‘samosa’- the ultimate comfort food made up of savory fried dough stuffed with global fillings like Chipotle Chicken, Morrocan Lamb, Butter Chicken & more. “Hari has made India proud in America. 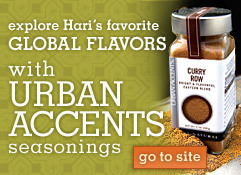 Now he brings his unique expertise to the world’s spices and elevates the flavours of our cuisine.” – Vir Sanghvi. Creating and testing new recipes is the best way to enhance your kitchen. Our team of talented chefs and a state-of-the-art test kitchen is our crucible for creating and testing out new and tasty recipes that will add value to your menu. Our expertise of creating and formulating new products and new recipes extends to both commercial and small batch production scenarios. With our finger on the pulse of the culinary market, you will always benefit from our advance knowledge that also includes the latest in food service technology and management. Training solutions that are custom created for the staff and employees of companies that cater to the hospitality and food service industry is one of the innovative solutions that we provide. Our workshops and training seminars are custom designed taking into account your specific requirements and needs. Our unique workshops also include one-of-a-kind team building sessions that will educate and train your chefs to perform better, thus helping your organization to create newer business opportunities. Do you have a new brand idea? Do you need to come up with a new concept for a brand? Would you like to bring to life a new idea that will give your culinary organization a presence? We have been providing food service organizations with specialized consultancy services for creating and launching new food brands and concepts from the ground up. Our experience and expertise ensures that your product will relate to your target audience with its unique features. We have created and developed innovative and attractive concepts and ideas that have captured the imagination of many. 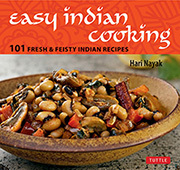 Hari Nayak is a restaurateur, author as well as a culinary consultant in North America. 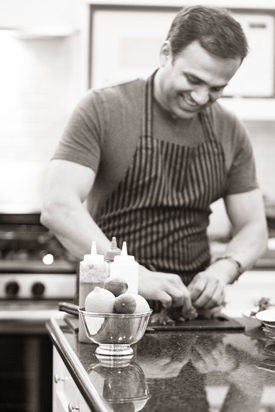 Hari Nayak started his epicurean journey from the Culinary Institute of America and today, he is one of the most sought after chefs for his unique style. Read more..
OUT for a DUCK in the West Indies! Cooking, Not Shopping, for Diwali!